Kyoto Animation‘s newest project, Myriad Colors Phantom World, is an interesting addition to the prestigious studio’s catalog. In the near future, everybody is affected by a virus that alters the brain’s perception of the world around them, allowing them to see “phantoms,” extra-dimensional entities. While they have always been present, people weren’t able to see the phantoms until their minds have been altered, and for the first time, people experience some of the phantoms’ more obnoxious antics. To combat the potentially harmful phantoms, children born with special abilities are utilized for capturing and sealing them. The plot revolves specifically around a certain team of phantom hunters as they face more and more dangerous phantoms. 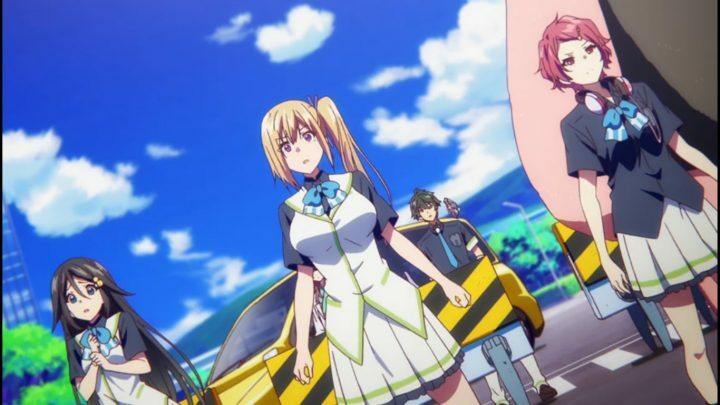 Before even watching Phantom World, it was easy to get drawn into it. The key art was colorful, the concept was interesting, and a new project with Kyoto Animation’s name on it always seems promising. It was an interesting watch, but by the final episode it didn’t all feel consistent. While there was gorgeous art throughout, clever visual metaphors, and a lot of fun (and sometimes heartfelt) episodes, it wasn’t always smooth sailing for Myriad Colors Phantom World. 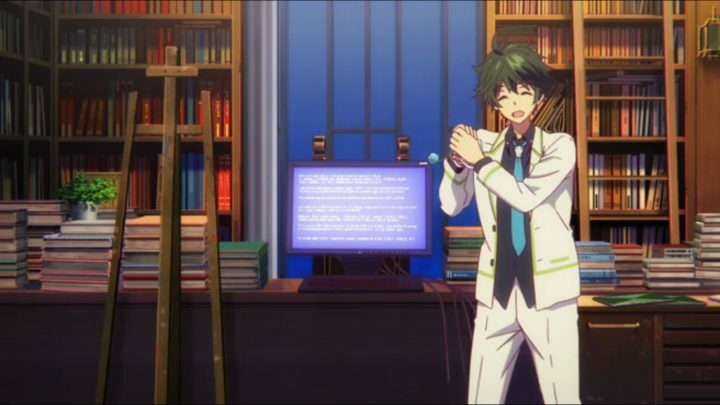 Right off the bat, Myriad Colors Phantom World introduces itself through a presentation narrated by our protagonist, Haruhiko, and his phantom sidekick, Ruru. Haruhiko explains the show’s basic concept, that people have been neurologically altered by a virus and can now see phantoms. In the beginning of each episode, Haruhiko and Ruru give a lecture in relation to what the episode is about, and while it’s sort of entertaining in the first episode with Ruru being used to present a variation of different optical illusions, it wears thin quickly, almost becoming uninteresting enough to skip past altogether. The first couple of episodes introduces us to about half of the main cast, who all work together to capture a telephone pole phantom through a game of limbo. This is, of course, an unconventional way to go about capturing a phantom, but it does an excellent job displaying the light-hearted spirit the show strives for. However, the limbo scene boldly features some rather perverted comedy, definitely more worthy of an eye-roll than a laugh. This perverted sort of humor holds some prominence in the show’s presentation for a while before going away (for the most part) after the first few episodes. It was nice to see the comedy shoot for something a bit more clever later, but it left an odd impression for the following episodes, almost as if it was never welcomed in the first place. As far as the first two episodes go, every character seemed pretty one-dimensional, as if they were given a mold of a specific role to fill. However, episode three gives us some deeper character exposition for the first time. 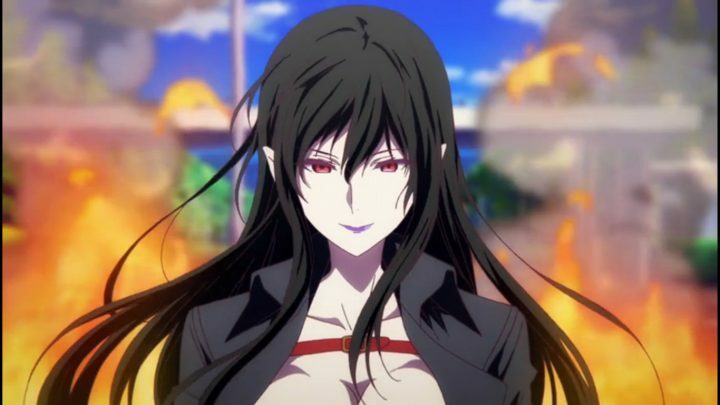 Mai, the phantom hunting team’s athletic member, meets two phantoms on a bridge who are connected to her past. She didn’t recall very well who she once was, but after facing the two phantoms, she learns that she was a bratty and abrasive kid. Mai thought that she used to be more of an introverted and shy kid, and this revelation came as a shock to her. It’s only uphill from the stunningly animated, albeit rocky, start. This was a pretty clever way to integrate phantoms into the characters’ personal stories, making the phantoms feel more like a vital part of the story as opposed to some sort of a loose concept or gimmick. These kids are the first generation to live alongside phantoms, and with the phantoms being the backbone of the new world around them, it’s only natural that their lives would be shaped and so heavily influenced by their presence. Implementing phantoms as an essential plot device is brilliant, and fortunately, Mai’s experience isn’t the last we see of its utilization. In fact, it only gets better, and the show as a whole is only uphill from Phantom World‘s stunningly animated, albeit rocky, start. Following up Mai’s character exposition episode is Reina’s character exposition episode, in which we learn that she is more than simply a nice girl with a rich family and a ridiculous appetite. Reina is hypnotized when she boards a phantom bus that takes her to what seems to be another world. 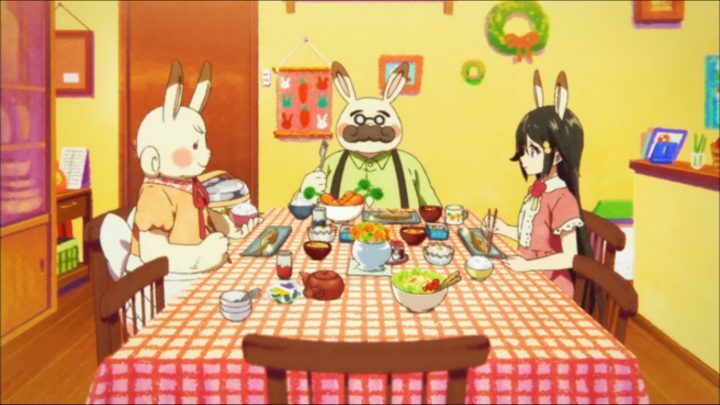 In this world, Reina is with a family of rabbits that accepts her as their own daughter, and she seems to be very comfortable and happy in her new home. This reveals that Reina has a lot of trouble at home with her real family. 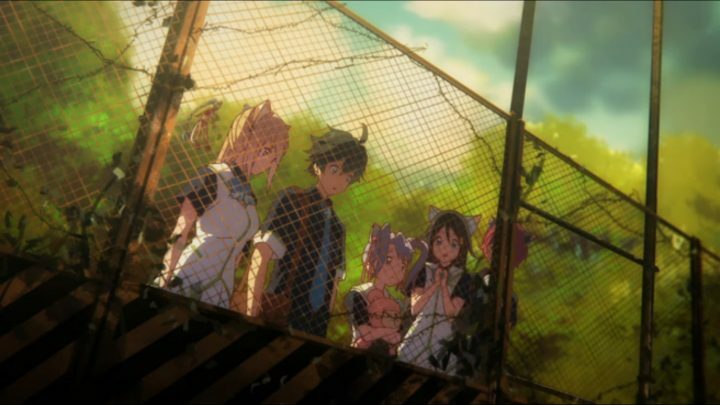 I thought this was an oddly charming and heartfelt way to reveal a heavy backstory, but it also presents one of Myriad Colors Phantom World‘s strengths, and that’s its knack for creating a visually thrilling setting. KyoAni has always been very talented with crafting an environment that holds a personality in and of itself, and Phantom World, a show that occasionally features some fantastical settings, makes for a fantastic outlet. This alternate world that Reina enters is very bright and cute, with everything looking as if it were colored in crayon, depicting a sort of childlike innocence. Despite the setting being as colorful and engaging as it is, the episode itself is pretty light on content, almost as if it is all a case of style over substance. Similarly, in episode six, when Kurumi, the phantom hunting team’s youngest member, has an entire episode built around her fascination with bears, another alternate setting is utilized to depict her adolescent imagination. This setting is a lot more detailed than the one displayed in Reina’s episode, appearing as if it had just come out of a whimsical fairy tale. Kurumi, Haruhiko, Ruru, and her stuffed bear, Albrecht, must face a threatening adversary: an army of other stuffed bears. Halfway in, the anime’s full potential has yet to shine. While the eye candy in this episode is as dense as Phantom World gets, there is very little exposition present at all. 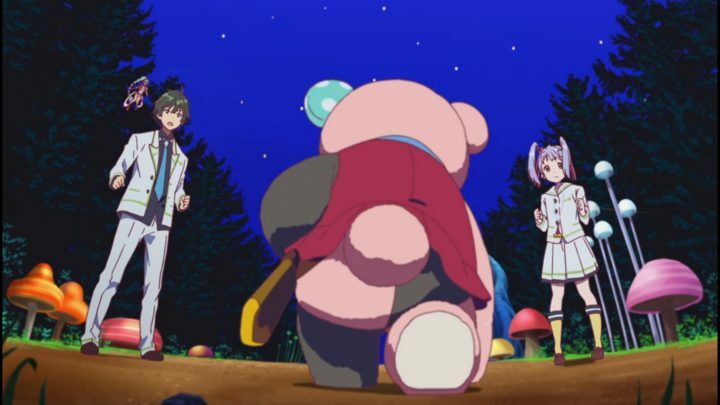 With little explanation, Kurumi becomes a magical girl and single-handedly defeats the evil army of bears. She never becomes a magical girl again, just whenever it was most convenient. Myriad Colors Phantom World has shown it could look pretty, but halfway in, its full potential has yet to shine. In its latter half, Phantom World becomes significantly more entertaining. Following a streak of episodes that focused on individual characters’ backgrounds comes an array of fun one-off stories built around new gimmicks for each episode. It’s at this point in the show when Phantom World feels like it really hits its stride. It all kicks off with an episode based around Schroedinger’s Cat, or, more literally, people turning into cats. As cliche as it sounds, it doesn’t come off as feeling stale at all. Phantom World‘s sense of humor finally feels more grounded, and everything seems to benefit from it. The art and animation is as lively as ever, and now that the characters are further established, sitting back and watching them turn into cats, trying to shoo off pesky, perverted monkeys, or perform in a play about combating a yokai in medieval Japan is really easy to get pulled into. With a couple of genuinely heartfelt episodes rounding it all off, this is definitely Phantom World‘s peak. 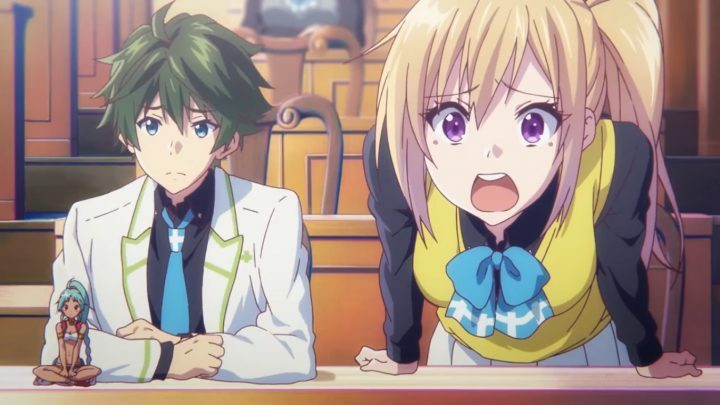 Thankfully, Phantom World doesn’t finish poorly, but the final two episodes are sort of predictable and not all that creative in contrast to the rest of the show. A main antagonist named Enigma is introduced as a phantom capable of stealing the abilities of phantom hunters. Enigma has been attacking phantom hunters, and everybody is on high alert. Also, Haruhiko’s mother, who had abandoned him when he was younger, has finally decided to come back into his life. At first Haruhiko is skeptical, but before long they get along with each other very well. The two final episodes are the only episodes in the whole show that focus around a single continuous story, and the first episode of the pair is sort of the Haruhiko background episode we didn’t see in the first half. While from an expository standpoint it’s pretty light on content compared to the other characters’ episodes, it does provide a decent setup for the final episode, which disappointingly doesn’t deliver a whole lot. The final episode has some of the most colorful and beautiful sequences yet. The final episode features a final battle between the cast and Enigma, and it’s unfortunately shamelessly cliche. This is very disappointing, especially because the rest of the show proudly toted some very creative ideas. It would have been nice to see Myriad Colors Phantom World go out with a final bang as confidently unique as the rest of the anime. Despite that, the final episode alone displays some of the most colorful and beautiful sequences the show has to offer, and it’s a refreshing visualization to close off the series. All in all, Myriad Colors Phantom World can be an enjoyable watch. However, it’s a very light watch. Much of what Phantom World presents is pretty pictures, vibrant colors, and nice looking characters with limited personality. It knows what it’s trying to be, but that doesn’t change the fact that what it ultimately is, isn’t much.